I’m usually in the camp that believes it’s unfair to expect a movie to tell the story entirely truthfully, or complain that a movie doesn’t adapt source material as thoroughly as some may want. That being said, a ton of the dramatic moments in Bohemian Rhapsody really pissed me off, and the dishonest portrayal of this lead character, in moments, takes away from his memory and intent to remain mostly guarded and private about his personal life. I’m not necessarily against a Queen movie, or a Freddie Mercury movie, but I am against disparaging his memory or telling a story that isn’t even close to honest. Especially when it shies away from his queerness and relationships. It’s not just dishonest, it’s dishonest and safe. The movie tells the story of the formation and rise of Queen, as well as Freddie’s AIDS diagnosis. The movie’s timeline is skewered in that the movie has him reveal his diagnosis to the band in 1985 so that the movie can conclude with a monstrous recreation of the Live Aid performance. There’s a band breakup that never occurred, a venomous personal assistant that seems somewhat unaccounted for in real history, and very little about Freddie and his eventual partner until his death Jim Hutton. Very little of Freddie’s sexuality and relationships are explored, instead focusing in on party scenes and extravagant wealth which leads the band and Freddie to split. This movie would have you believe he started dating his future partner and reconciled with his traditionalist family all in one single car ride. 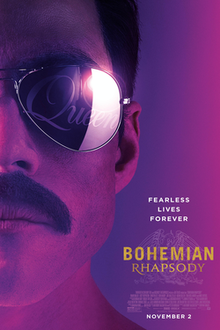 The whole dramatic focus of this movie is all over the place, and really, any scene where there wasn’t Malek lip-syncing to Queen songs was a complete disaster. The performance scenes are great, though. There’s wondrous attention to detail, and Malek shines on stage even though he struggles to shine as Mercury the person. The Live Aid recreation, for some, may be worth the cost of admission on its own. For me, it’s not. 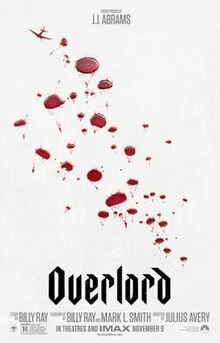 Overlord is produced by J.J. Abrams for ‘Bad Robot,’ originally intended to be a Cloverfield script which took on its own life and growth. A literal screenplay about Nazi Zombies, the story follows a crashed grouping of American troops who encounter a Nazi-occupied town in France, where the church at the top of the hill has become a horror house of human experiments. The movie starts as a pretty uninspiring/seen-it-before war film, where our characters crash land and have to swim to shore and regroup. They don’t become POW’s however, and use their ingenuity to sneak into a town and take up residence with a particularly shrewd local woman and her little brother. When they find out what kind of work is being done in the church, there’s a question of whether they should follow mission orders and just take out a satellite, or act on gut and ingenuity alone to take down an operation that turns live people into unfeeling, heat-seeking, rabid monsters. It’s a mix between a zombie and a super-soldier, really. We have a Nazi commander who acts as the primary antagonist of the film, and the steps of the plot moving from place to place often does feel like a video game, but it always felt like a video game I’d enjoy playing. The narrative isn’t perfect, the characterizations are fairly flat, but the atmosphere and situation makes this movie seem really interesting. In fact, it reminded me of some of the better parts of Wonder Woman or Fury the last few years, where these American soldiers are forced to co-mingle with oppressed European citizens. It has the makings of a liberation picture, but it ends up becoming more about the end mission: stopping the experiments. There’s a lot of cool makeup and practical effects, and the movie only shows the audience a view zombie moments to keep them fresh and exciting. This movie’s best quality is that it doesn’t over-saturate. It doesn’t really try to be too funny (though it has funny moments), and it doesn’t try to be too gory or too scary. Instead, it picks its spots for the excitement, builds the narrative up, and ends with a pretty cool finale. It doesn’t reinvent the wheel, but as we head into Oscar season and are littered with dramas, it was nice to get this genre mashup of horror, science fiction, and war, and I rather enjoyed Overlord. A remake of Italian director Dario Argento’s 1977 film of the same name, Suspiria finds rising director Luca Guadagnino taking on the horror genre by exploring themes such as religion and motherhood. 2018’s Suspiria is an occasionally vexing and messy, but always riveting experience. It doesn’t always check all of its boxes or contain its various plot threads, but it just works so hard to be unnerving and mystical at the same time. It really worked for me, and is one of my favorites of the year despite its faults. The film focusing on a dance academy which is actually run by a coven of witches, beholden to Mother Suspiriorum. The ancient founder of the academy, Helena Markos, is not seen on screen, but a vote takes place where the other witches choose the ancient figure over Tilda Swinton’s Madame Blanc. Around this same time, where there’s growing discord amongst the witches, psychologist Dr. Josef Klemperer meets his patient Patricia (Chloe Grace Moretz), an escaped student of the academy who is trying to tell everyone about the evil practices done at the academy. In Patricia’s absence, the academy takes in Susie (Dakota Johnson), a talented dancer who left her mother on her deathbed back in the United States. A plot begins to have a sacrificial sabbath within the coven to strengthen Helena Markos, while the dancers work on a piece of expressionist performance called “Volk,” now led by Susie. There are a few themes touched upon, whether it’s the idea of motherhood and the sacrificing of younger vessels to keep the matriarch alive or the battling of various mother figures to make the largest impact on the young women. Another possibility is the idea of religion, where each person vying for their own agency while thrust into this horrific settling handles conflict and dissent differently. Susie is different than Blanc, who is definitely different than Markos. Faith in the people around, as well as their motherly relationships drive the conflict home while supernatural elements creep in the shadows and sometimes emerge out of nowhere. Particular scenes of body horror and supernatural rituals leading to intense gore definitely occur, but they’re all earned behind the slow burn that is the plot. The drawback is the unnecessary setting of this movie, where I’m not sure what Guadagnino was going for in setting this around the time of the Cold War. The Berlin Wall plays a role for some of our characters, and I’m just not sure why. The exploration of relationships between the witches and students all works and feels congruous, but any political subtext falls completely flat. Outside of that one subplot or one piece of atmosphere that doesn’t work, I don’t have any additional complaints. It’s a challenging watch. It’s introspective, slow, dirty, and often cruel to its characters. But it’s also oddly beautiful, muted in color except for occasional pieces of clothing which bite a largely white and grey backdrop. When the intense violence happens, it’s done in a way that keeps its shock factor, and reminds the audience of how sinister something like a self-contained coven of watches can be. It earns its scares more than a modern American horror film would, and for that, I love how much of a grind this movie felt at times. When we arrive at the conclusion, and all of the parts fit together, a certain character will have taken things into her own hands and found her agency above the setting we’ve grown accustomed to. Whether that’s for better or for worse is up to you to decide. Based on the memoir from biographer-turned-conartist Lee Israel, the new film Can You Ever Forgive Me? has a twinge of biopic drama, a bit of comedy, and a bit of heist-like crime. Written partially by rising writer/director Nicole Holofcener and directed by Marielle Heller from indie hit The Diary of a Teenage Girl, this movie works well, but can’t often decide whether it wants to embrace zaniness or stick to a prestige-style biopic. Melissa McCarthy plays Lee Israel, whose funds have dried up after some initial success writing about famous women in the entertainment industry. Her agent has abandoned her, and she’s struggling to support herself. Two things then happen, first, she begins selling her personal belongings for money, leading to the discovery of the market on relic letters written by authors, and second, she meets the pseudo-homeless and delightfully fake-sophisticated Jack (Richard E. Grant) who quickly becomes a friend of Lee. Lee begins falsifying letters in the voice of famous authors, and sells them at a huge profit to collector stores and book shops all around the country. During this process, she not only deals with the criminality of her actions, but also the struggle about her worth as a writer. She accomplishes a great deal with these forgeries, and it bolsters her confidence, but she obviously cannot take any public credit for it. So, when she involves Jack in her enterprise, he doesn’t treat it with the same kind of care that she does. As the market begins shrinking around her due to a knowledge that forgeries are being floated around, Lee has to refine her approach. Parts of this movie function as a pretty good biopic, where Lee’s grating personality gives the movie a slightly unique charm. 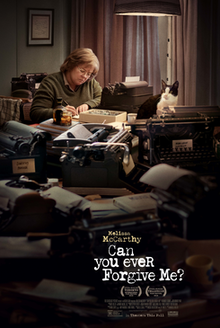 McCarthy’s performance does a really nice job of capturing a reclusive but vulgar personality, and she was the right fit for what this movie wanted. However, it’s Grant’s performance that really stands out. The rest of the movie is plain, mildly tense, and mostly just floats from scene to scene without much significance. When Grant is on screen, it’s elevated up to something more, with his nuanced performance really carrying the movie. 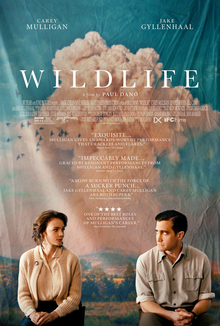 Paul Dano’s directorial debut Wildlife is excellent. It takes cinematic nuances from classic films and implements them systemically, calling back films such as The 400 Blows with certain scenes. At its core about a crumbling family, we delve into the parents’ mindsets and how the erratic behavior in their separation affects their teenage son, just entering his formative years. It’s well acted, wonderfully directed and shot, and really soaks in the community and scenery of rural Montana where it takes place. The more I think about it, the more I’m sure this will crack my top 10 by the end of the year. Jake Gyllenhaal’s Jerry and Carey Mulligan’s Jeannette have recently relocated to Montana, where Jerry works as a club pro at a golf course and Jeannette acts a stay-at-home mother for their teenage son, Joe (Ed Oxenbould from The Visit). When Jerry loses his job and is too prideful to take it back when management reconsiders, he decides to fill the employment-shaped hole in his self worth by heading cross-county to fight in a treacherous fire that has ripped through the local forest. The once supportive Jeannette begins unraveling at her husband’s departure, growing close to local car salesman Warren Miller (Bill Camp) and trying to find a way to make ends meet. Joe wants to see his father come back and his family go back to normal, but things change as Jeannette takes matters into her own hands. Things are signified that show how the parents grow apart, much of it locked up in personal baggage concerning pride and self-worth. Jeannette feels betrayed by her husband’s leaving, but has trouble finding steady, full-time work on her own. When the wealthy local takes an interest in her, she makes a decision. In addition, clues such as her disparaging her own name or taking Joe to see the fire rip through the countryside signifies not only that she understands her family’s unraveling, but embraces it. Jerry on the other hand becomes an absentee father, making pennies fighting against destruction. His return after winning the struggle sees him expecting his family to be waiting for him after the events, but real life is more complicated than that. Joe’s arc, or lack thereof, is about his attempts to reconcile and understand how much his life is changing over a short period of time, and how he has to become somewhat self-dependent as his mother begins focusing more on herself. Carey Mulligan may be a career best as Jeannette, a character walking the line between sympathetically emotional and selfishly non-empathetic. She’s intrusive about Joe’s life, she talks far too much about things that are not appropriate for him to hear, so Joe is forced to mature. It’s clearly poor parenting, but it gets us to where the movie wants to take us. The rare scenes with Jake Gyllenhaal’s Jerry are clearly bolstered by Gyllenhaal being one of the best actors working in the business. His role in this movie, although scaled back in terms of screen-time, is acted wonderfully. We see the world, often basking in at the scenery or marveling at the rustic town, through the mostly naive Joe’s eyes, and Ed Oxenbould, for a young actor, does a decent job carrying the movie. He’s clearly a weak point, but he’s a good enough vessel for the movie to totally land its intended effect. Occasional drags in structure or flickers of weakness in Oxenbould’s acting is not enough to even go into a separate criticism. This is one of the best and most well-conceived films of the year. In previous reviews regarding the current state of the press/media in our country, I had stated how important it was during these times to seek out honest journalism and for all of us to become more discerning when digesting important news. While there are a few different ways to interpret A Private War, a movie that acts as a direct and spiritual guide throughout foreign journalist Marie Colvin’s career, it’s clear that the movie attempts to impress the importance of the press in providing detailed accounts from around the world that mainstream audiences rarely get to hear about. Colvin would travel from country to country, in crisis to crisis, and humanize those effected as much as possible. For those who don’t know the story (and I didn’t really before seeing the movie outside of recognizing the name), Marie Colvin was a foreign correspondent journalist for a reputable British paper throughout the 1900s and early 2000s. She was known for heading headfirst into international crises and getting boots-on-the-ground reporting. Colvin is portrayed by Rosamund Pike. During the run of successful stories, Colvin would befriend a specific photographer, Paul Conroy (Jamie Dornan), who would begin accompanying her throughout every intense mission. The title likely refers to her personal struggle behind the inflammatory work. The amount of time she spent walking through war zones, and in some cases getting physically affected by them (she lost the use of one eye after shrapnel struck her), left her with pretty pervasive PTSD. She had seen plenty of dead bodies, after-effects of war, and even just impoverished, sheltered women and children who were starving. Her “Private War” was actually about her addiction to the action, as she entered the fray again and again and suffered for it. However, once the movie hits its stride after a poor opening, it becomes intensely involving. The war scenes are really good, and the slow development of her style from story to story starts becoming really compelling. My issue was that it all felt occasionally like too little too late, where I was watching individual scenes and marveling at the style, but then dumping cold water on myself by reminding my subconscious of the lack of development that all of the characters got in the opening act. Overall, this movie is still enough of a success in pieces that it’s worth recommending, and Pike does a nice job in the lead performance.